Real Sociedad manager David Moyes was sent to the stands and his side were knocked out of the Copa del Rey at the last-16 stage against Villarreal. The former Everton and Manchester United boss remonstrated with officials over an offside decision and was ordered from the touchline. Villarreal progressed 3-2 on aggregate after the second leg finished 2-2. Trailing 1-0 from the first leg, Moyes's side fell further behind when Giovani dos Santos teed up Gerard Moreno to fire home the opener on 26 minutes. Former Arsenal striker Carlos Vela gave the hosts hope just before half-time when he bundled in the rebound from close range after Sergio Asenjo had saved Imanol Agirretxe's headed effort. However, former Barcelona and Tottenham Hotspur forward Dos Santos put the tie beyond doubt when he put Villarreal back in front 17 minutes from time. 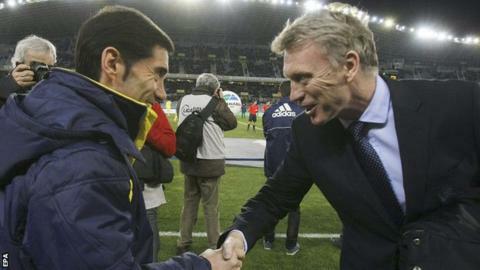 Esteban Granero replied moments later to ensure Moyes remains unbeaten at home in his five games since taking charge.